Discuss the use of materials in this installation, and the way in which the materials transform the coastline and interact with the environment. 1a) The coast is wrapped with a huge piece of white fabric and the cloth is tied to the coastline by ropes. It transforms an ordinary coast into a magnificent piece of art. The white piece of cloth is monochromatic in colour and it transforms a multi-coloured tropical coast into a large white sculptural piece. The usage of cloth contributes to the flowing effect that the work displays, adding a vital sense of fluidity, such that the work looks like a waterfall. The white cloth conceals most of the coast, leaving only the basic form and shape of the coast, which leaves the viewer to imagine what is beneath the cloth as covering the coast with a singular coloured cloth emphasises the importance of shape and form in the work. It also brings out the massive scale of the work. The cloth is folded in different areas and the position, direction of the folds will change with nature as when the wind blows, the cloth will change in terms of its folding. It also interacts with nature in a way that it "reflects" nature, for example in a sunset, when the rays of the sun are casted upon the work, the warm tones of the sun are reflected due to the white fabric being a reflective surface. Any weather changes will also cause the quality of the fabric to change as the fabric may wear and tear as it shields the coast from storms. The colour scheme is also contributed by the shadows formed when the fabric is folded and tonal variation is present as the shadows may be in different shades of grey, adding a sense of change to the work. The materials also contribute to the line work present in the artwork. The ropes are the most obvious lines present. The folds also contribute to the line qualities of the work. Since folds are different in size and the way that the folds exist, it makes both horizontal and vertical lines present in the work, contributing to the visual quality of the work. There is also a "line" which separates the wrapped coast from the unwrapped portion, which is contributed by the fabric. The contours(also a type of line) of the work separates the work from its surroundings. The shape and form of this work is ambiguous as the work is a huge combination of different shapes and forms of varying sizes. Forms are mostly angular and geometric, with sharp edges, and they protrude out of the fabric. Since the details of the coast are concealed by the fabric, the form of the coast is enhanced and the importance of shapes is brought out. Abstraction of the coast makes the viewers notice the forms more as distracting details are omitted. The work undulates with nature, its surroundings. The viewer also gets to interact with the work as they can physically walk through it. The fabric has transformed a multi-textural coast into one with homogeneous texture(due to the fabric). 1b)The fabric that covers Christo's work can be recycled after the work is "demolished". This shows that Christo is trying to raise awareness for the importance of recycling as our world is constantly being destroyed by humans. He also wants to say that art can be environmentally friendly too and hie work contrasts with conventional art where traditional materials(which can hardly be recycled) to bring his environmental message across. The work is site specific, it is nature(the coast is nature itself) situated within nature(its surroundings) and the cloth covering it can also be recycled. It shows that nature is art too, so we should stop destroying nature and start protecting our mother earth, or else mother earth will perish in years to come, just like how this work will be demolished after being on display for 10 weeks due to its ephemeral and temporary quality. Christo's work also raises artistic concerns as it defies the notion of conventional art: it is not displayed in a gallery and instead, the site of display is the work itself. It challenges the definition of art. The materials used are non-traditional and Christo makes use of already-existing materials and sites to transform them into his own work. This concept is evocative of Dadaism, like Marcel Duchamp's "ready-mades", where "ready-mades" are juxtaposed together to form an artwork. Christo has harmoniously combined the "ready-mades" to form a sculpture-like work as the white surface is evocative of traditional white marble sculptures. It also challenges the notion of the artist being the creator of the work. Christo only came up with the idea, he planned out the construction of the artwork, the measurements etc. The actual making/creation of the artwork is done by a few thousand volunteers, Similarly, in "Wrapped Reichstag", the building is wrapped by volunteers and workers while Christo only supervises. With this, some people argue that the work is not Christo's as he did not do the work! In traditional painting, the artist plans out the composition and paints the work himself and in contrast, Christo only acts as the "director" of the work's creation. Therefore, Christo seeks to question the definition of art and change people's mindsets about art. Christo Javacheff has explored the use of materials in conjunction with different spaces/ environments creating an ephemeral quality in his work. Discuss reasons why you think he has created his work in this manner. Do you think the work he has produced has been effective? Discuss with reference to his named works. 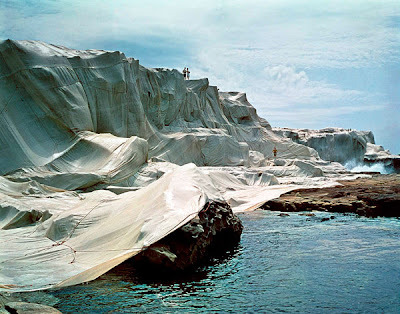 1c) Christo has created his works in this manner so as to explore the temporary transformative quality of the work. He wants to transform Wrapped Coast temporarily, but not transform it permanently as it is like concealing mother nature forever as he does that. By wrapping huge scaled coasts and buildings(with reference to "Wrapped Coast" and "Wrapped Reichstag"), he is conveying a sense of preservation of the huge coast and building as white cloth is the symbolism of purity, so he transforms his works and return them to their raw quality for a short span of time. By creating ephemeral works, he wants to convey the message that nothing can last forever and everything will come to an end when the time comes. It hints at the fragile quality of so many things around us. For example, the Reichstag building was burned down by Hitler and the Nazis and was rebuilt after the war, so by wrapping Reichstag, Christo is telling us that we need to protect this building, or else it will be temporary like the rest of his works. By creating temporary works, he also brings out the idea that the process of art making is important as the artwork does not last forever, which highlights the importance of the art making process as it contributes to the significance of the artwork as well. He also wants to convey the fact that we have to treasure what we have. His works are not long-lasting and will be destroyed, so we have to treasure the time that the work existed as that is when the work is most alive. Now, only photographs and memories of the work are left. Through this, he is telling us that we cannot take things for granted and we must cherish it when we have it. He creates works at different places(for example "the Umbrellas" in Japan) as he wants to let us know that fragility is present everywhere, so we must be careful not to destroy fragile things. The work, Wrapped coast is effective as it brings out the fragility of nature, emphasising the urgent need to protect nature. His work is created by man and destroyed by man, which shows that if man carries on with his ways, we will eventually destroy everything and everything will come to an end. Therefore he is effective in conveying the environmental message that he wants to convey.